I have discovered a wonderful trick in gaining a healthy and positive perspective on body image. It is so simple. And I'm sure the therapists and psychologists are all like, "hunny this is nothing new" because my therapist just prescribed a similar technique for a different situation recently. BUT, it has been new and so helpful to me so I want to share it with you! When trying to gain a better perspective on body image, we know the messages we hear and try to tell ourselves. Just be happy with yourself! 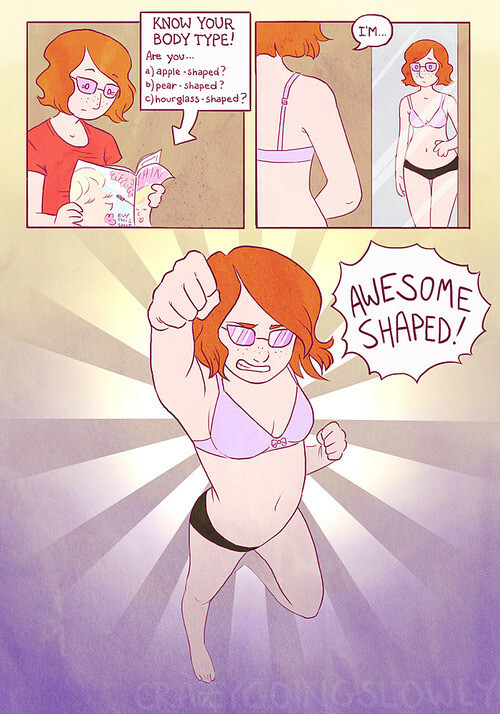 Love your body! No one else can be unique like you! Stuff like that, which is all good and great but much easier said than done. The problem is that we are fighting against years and years of habits of self-criticism and comparison, and like any habit, they're not easy to break. I have found that even when I try to cut out the criticism part and only say positive things about myself, I am still comparing myself to others. If it's not, "ugh, I'm not as good as...", it's, "well, at least I'm better than..." and neither of these things are loving or positive or healthy. I would swing from feeling like a frumpy blob to feeling like I had the curves of queen Beyoncé herself. Neither of these were particularly realistic or helpful. What has really helped me is this: instead of attaching a positive or negative feeling with the part of my body I happened to be analyzing at the time, I simply acknowledge it as mine. That's it. No further conversation. It's just mine. Those are my legs. That is my belly. This is my chin. And moving on. Being able to do that took away the power of those two major issues I was experiencing. First, it stopped me from attaching a negative emotion with those parts of my body and instead made me gain a practical appreciation for those body parts. Those are my legs...and that is why I walk. That is my belly...and it's soft and contains a lot of crazy important organs and possibly some day a human. This is my chin and it makes me look very distinctly like me. Separating my thoughts completely from unnecessary and damaging emotions was step one! Second, it left no room for comparison. When I acknowledge that my hips are just my hips, then why would I start comparing apples to pears? (ho ho...bad joke). To take it a step further, if I noticed another person who I could possibly be envious of, I would just say "that is her _____". This would cut the comparison habit right out of the picture. I know it sounds simplistic, but it's been so freeing. I can spend considerably less time agonizing in the mirror, because all those things I used to worry about are just mine and for that reason there is no need to attach negativity to them. And I can spend even less time stacking myself up against other girls because their bodies are theirs, we are different, and that's just how it is! So give it a shot. Let me know how it works for you!